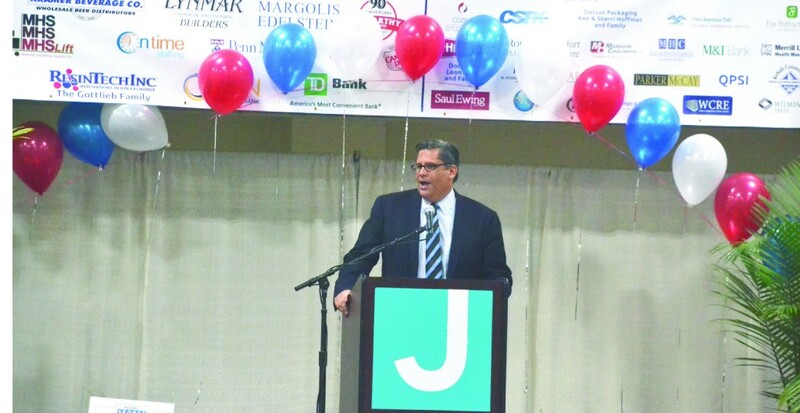 On Sept. 26, Jacobs received a Lifetime Achievement Award at the Katz JCC Sports Award Dinner. At its annual sports award dinner, the Katz JCC gave long-time Cherry Hill resident Sam Jacobs its Lifetime Achievement Award for his achievements on the basketball court and his service to the JCC and the community. However, Jacobs said the award isn’t just about him. As much as he’s given back to the JCC, he said the JCC has given him a lot as well. The Lifetime Achievement Award is the latest in a series of honors Jacobs has received over the last few years. In 2015, Jacobs was inducted into the South Jersey Basketball Hall of Fame as well as the Philadelphia Jewish Sports Hall of Fame. Jacobs is also a member of the Cherry Hill West Athletic Hall of Fame. Jacobs was a star high school basketball player in the early 1980s in Cherry Hill, scoring more than 1,000 points over the course of his career. Jacobs started high school at Cherry Hill East and later transferred to Cherry Hill West. Jacobs’ senior season in 1983 was his favorite memory from his high school career. Jacobs helped lead Cherry Hill West to a 25-win season and a trip to the South Jersey Group IV championship game against Atlantic City High School. Jacobs attended Cornell University, where he helped the Big Red to a historic 1987–88 season. That year, Cornell won its first Ivy League title and went to its first NCAA Tournament since 1954. As a №16 seed, Cornell face off against one of the top schools in the nation, the University of Arizona. Arizona featured future NBA players such as Steve Kerr and Sean Elliott. Beyond all of the wins and achievements on the court, Jacobs said basketball taught him a lot about life. Jacobs returned to live in Cherry Hill in the early 1990s and has been a part of the community ever since. For him and his wife, Lisa, choosing to live in Cherry Hill was an easy decision. Jacobs has been involved with the Katz JCC in a number of capacities. As a kid, Jacobs recalls visiting the JCC and hanging out while his brother played basketball. As an adult, Jacobs served as a JCC board member for a few years and has also coached youth basketball. Jacobs jumped into coaching in 1997 when he was the Team South Jersey girls’ basketball head coach for the Maccabi Games in Seattle. Receiving the Lifetime Achievement Award was a different feeling for Jacobs than when he was inducted into one of the sports hall of fames. He said the award goes beyond sports and focuses more on service and the impact of the JCC in the community.